After ten years of starting and running a successful landscape construction business Paul Werni wanted to spend a little more time with his family and decided it was time to move on. At first he was considering some type of manufacturing company, but wasn’t passionate about anything he was seeing. And then, as luck would have it, he received a home brew kit for his birthday. He enjoyed it, but since Paul is more of a cocktail than brew guy it got him thinking about distilleries. He read up on everything he could find on distillation and attended numerous workshops in New Hampshire even traveling to Germany and Austria to learn more about running a small distilleries. Paul decided he wanted to create a world class vodka where he could purchase the grain right here in the Midwest. He discovered that creating a premium vodka was reasonably achievable but opening a distillery is a major undertaking. It requires a significant upfront investment and at that time was unusual in the Midwest, but having the backing of his wife and family Paul, as well as his college roommate Scott Davis, decided to take a chance. Living in Minnesota, Paul originally thought of opening the distillery there but at the time Minnesota had a $30,000 annual permit fee. Growing up in Wisconsin and an annual permit fee of only $1,000 made it a pretty easy decision on where to put the business. And in 2007 45th Parallel opened their doors. We sat down with Shafer Hartman to learn more about their operation. Shafer, currently head of sales, had worked for Paul in his prior business and decided to join 45th Parallel five years ago. Shafer has worked in a variety of operational roles before taking on his current job, traveling across Minnesota and Wisconsin spreading the word about 45th Parallel. The grains used at 45th Parallel are produced locally from Rusmar farm located eight miles from the distillery. Then 45th Parallel does the mill, mash, ferment, and distill all within their facility. Once the fermentation is complete the used grain is shipped to another local farm four miles down the road where it used to feed their cows, pigs and chickens. Making it less than 16 miles for the entire cycle! Since a lot of water is needed for the distillation process, 200,000 plus gallons a month, it’s fortunate that the distillery is located where water is plentiful and inexpensive. Much of that water is used for cooling, so they are able to recycle it back into holding ponds where it is reabsorbed back into the ground. We’re also fortunate to live in a climate where wide temperature swings are perfect for aging American style whiskeys. After several years of making vodka they were approached about making whiskey on a contract basis and discovered they really enjoyed it. They now have a full service facility which includes bulk production, aging storage, private labeling and bottling services and recipe development. 45th Parallel has about 25 different spirits 9 of which are their own private spirits. They have a little over 1,000 barrels fermenting at this moment. 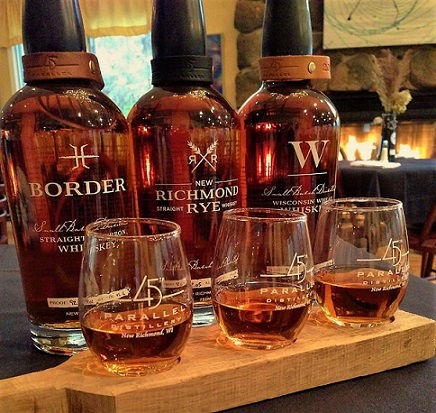 In 2013 they came out with New Richmond Rye, named for the town they’re located in. When they first approached Richmond about building a distillery they were all for it. The community has really embraced them. 45th Parallel has the philosophy that slow is best and they don’t do anything fast. Slow fermentation. Slow infusion. Slow distillation. Slow blending. Slow aging. 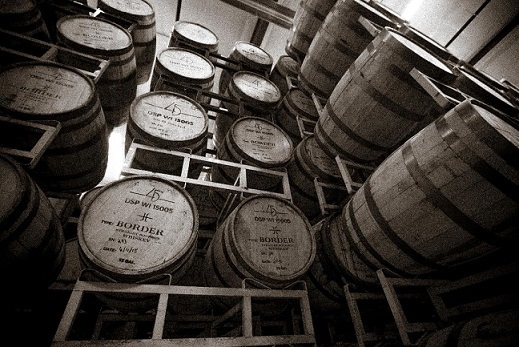 Small batch distilling is still very much in its infancy, starting in the last 12-15 years. 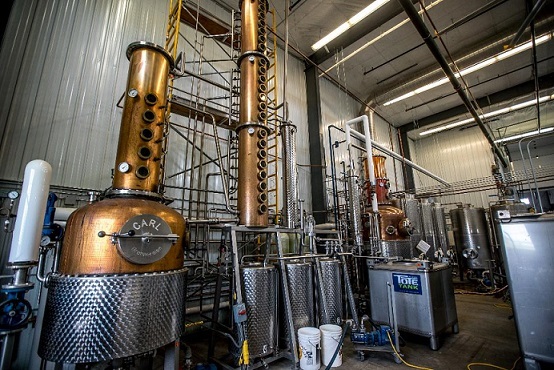 45th Parallel knows how hard it can be to break into the distillery business and they try to help by teaching distillery classes to people who are pretty serious about pursuing that business. They cover all the processes and have even made whiskey for those who’ve decided that they would rather focus on selling a private label of their own instead of making the whiskey themselves. Next up they are working on some single malt spirits that we look forward to seeing in a few years. Visit 45th Parallel and take one of their wonderful and informative tours any weekend. You can find 45th Parallel at most retail stores in Minnesota and Wisconsin such as Woodman’s and Festival Foods as well as many neighborhood stores. And of course you can stop in to The Red Oak Restaurant and try our Red Oak Manhattan made with New Richmond Rye Whiskey. Find out more on their website 45thParallelDistillery.com or follow them on Facebook or Instagram.